Argentine defender Daniel “Cata” DIAZ has retired. The 39 year old defender has called an end to his football career, per a statement from his current club Fuenlabrada. He played over 150 matches for Getafe and well over a 100 for Boca Juniors where he won numerous titles including a Copa Libertadores. 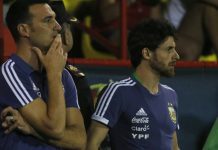 With the Argentina team, DIAZ was capped 12 times and scored once, a vital goal in a 1-0 win against Colombia during the 2010 FIFA World Cup qualifiers. Best of luck to Cata DIAZ. Copa Libertadores winner and part on Copa America team in 2007.